Two beautiful new palms were added at the Keeper’s House on May 5. 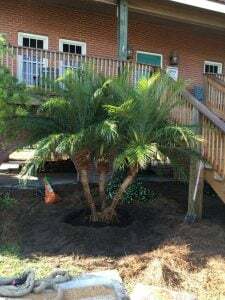 A Robellini Palm and a Sabal Palm were planted in the bed in front of the house on the east side to replace two palms that finally succumbed to cold damage suffered several winters ago. Tom Eddinger of Tom’s Palms did a masterful job of locating palms that would closely match those on the front west side of the house. He took great care in planting them, and was assisted by Phillip Grimes. 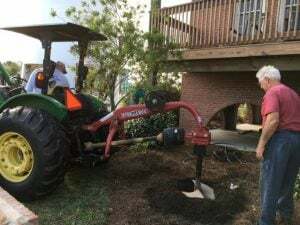 Interestingly, Phillip is the brother of Bill Grimes, the contractor who worked with our predecessor organization to straighten the lighthouse when it was knocked into a leaning position by Hurricane Opal in 1995. Also assisting with the job were SGLA Operations Manager Mark Vail, and park maintenance contractor Rudolph Cooper and his team who were on hand to adjust irrigation sprinklers for the new plantings. Tom and Phillip used an augur to dig the holes. 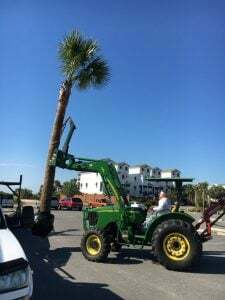 Palms were carried by Tom’s tractor.